Look ma, spoon-feeding the 2D tracker helps a lot! 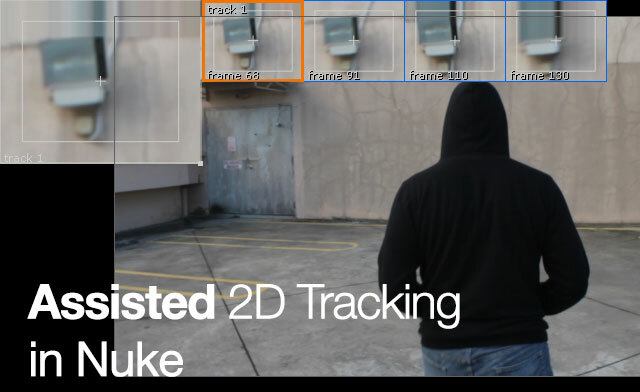 If you are using Nuke 7 and newer, one of the handy new features is the assisted 2D tracking. Previously, the regular 2D tracker aka Tracker node will either fail or drift away if the tracked pattern undergo changes in lighting or perspective. What it does is that instead of struggling to track a pattern that changes in lighting or rotation throughout a scene, the tracker now allows for the user to place keyframe of where the pattern should be. This allows the 2D tracker to use the keyframes that you have placed and try its best to not sway too much from the designated keyframes. Regardless of your intention for the assisted 2D tracking, there are times it will simply fail because the footage is too difficult for Nuke to analyze. Make sure there is enough resolution for the tracked pattern. Sometimes the pattern might become too small in the working resolution and it become gibberish to Nuke. Avoid tracking pattern that have similar pattern around its vicinity. This can cause Nuke to accidentally drift halfway between keyframes as it looks similar. Denoise your footage if the noise or grain is pretty noticeable. Track the denoise footage and you can apply it back to your original footage. If there is motion blur, you can always track manually as 2D tracker will often fail at this stage. When I mean track manually, you need to place the keyframe manually and judge the motion. Ensure you have your supervisor approval first! Lighting changes is something that can throw off regular 2D tracker but should not be much of a problem if the contrast is still there. Do grade the footage if you need more contrast from the tracked pattern. Perspective can be a pain but as long the pattern is still valid, the assisted 2D tracker can still do a great job in locking onto the tracked pattern. Just remember Nuke 2D tracker is still miles ahead compared to Apple Shake which gets my vote for the most traumatic experience in wrestling the 2D tracker (read: I ended up manually placing keyframe for most of the tricky shot).